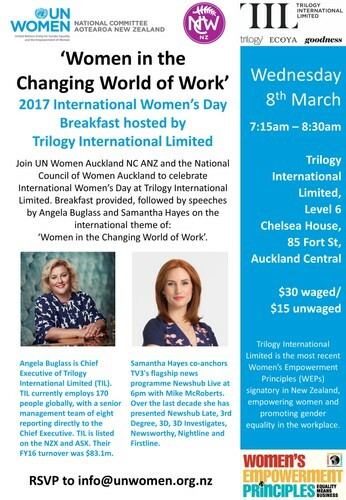 Join UN Women Auckland NC ANZ and the National Council of Women Auckland to celebrate International Women’s Day at Trilogy International Limited. Angela Buglass is Chief Executive of Trilogy International Limited (TIL). TIL currently employs 170 people globally, with a senior management team of eight reporting directly to the Chief Executive. TIL is listed on the NZX and ASX. Their FY16 turnover was $83.1m. Samantha Hayes co-anchors TV3's flagship news programme Newshub Live at 6 pm with Mike McRoberts. Over the last decade, she has presented Newshub Late, 3rd Degree, 3D, 3D Investigates, Newsworthy, Nightline and Firstline. - Samoa Victim Support Group which manages a 24-hour hotline service for victims of violence. It received 900 calls in its first year of operation. 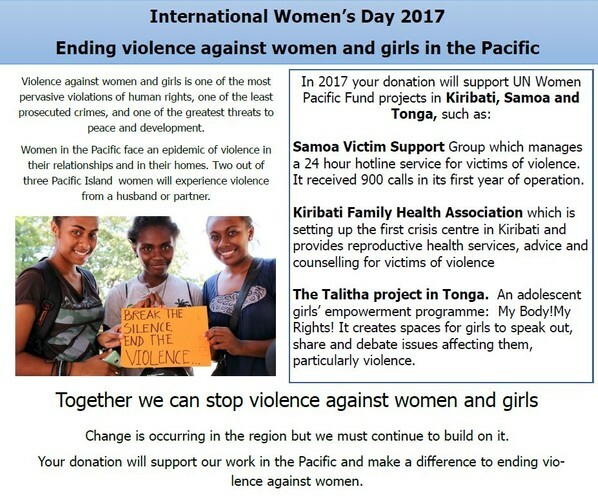 - Kiribati Family Health Association which is setting up the first crisis centre in Kiribati and provides reproductive health services, advice and counselling for victims of violence.